Storm doors by ProVia® protect your entry doors by keeping the elements out and keeping comfort in while adding value and style to your home. Every storm door is individually customized to the highest standards in the residential market for homeowners who appreciate impeccable, uncompromising quality. 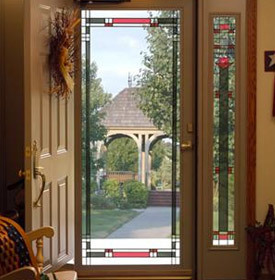 These professional-class storm doors are produced using 20% thicker aluminum than consumer-grade storm doors. Customize your storm door to meet the unique configuration of your entryway by choosing from one of our five series, numerous styles, 16 paint finishes, hardware, glass and accessories. With so many choices to choose from, we have built a door configurator, ProVia Studio, to help you eliminate the guesswork. Custom Built Storm Doors are designed and built to withstand the consisten rigors of active lifestyles and New England's ever-changing weather. Each door is manufactured with top-quality components using time-tested manufacturing techniques, providing you with years of carefree servce. Custom Built Storm Doors comple complete with safety glass storm panels and glare free insect screens, offering you year-round comfort and energy savings. With a multitude os styles and options to choose from, there is a Custom Built storm door to suit every taste and home style. At LARSON, our passion is delivering products that are built to protect what matters most. Our storm doors, security doors and windows offer everything from extra security and enhanced curb appeal to greater ventilation and increased energy efficiency. All of that adds peace of mind when you know your home is safe and comfortable for the people and pets inside. As the leader in the industry it is our duty to bring new ideas, innovations and quality products to the marketplace. 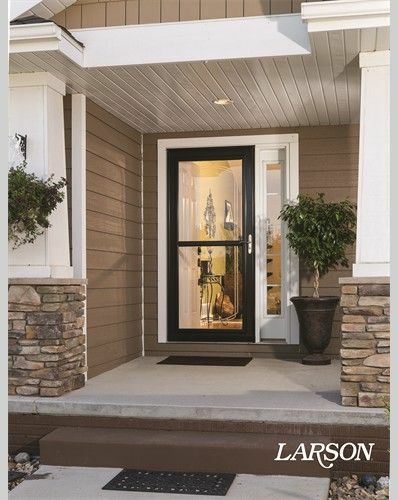 With over 20 patents and more new innovations every year, homeowners can expect LARSON to deliver. It is with pride in every detail that we have built our business.